Nevada’s third tallest peak is a step closer to shedding its Confederate name in favor of something far older and less controversial. 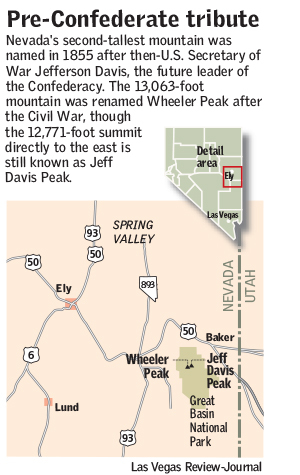 Nevada’s third-tallest peak is a step closer to shedding its Confederate name in favor of something far older and less controversial. 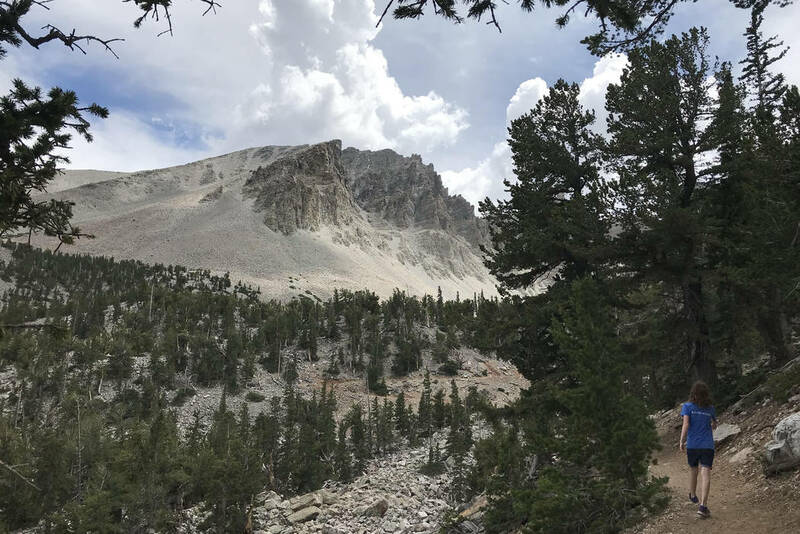 The Nevada State Board on Geographic Names voted unanimously to recommend a new name for Jeff Davis Peak at Great Basin National Park, 300 miles northeast of Las Vegas. If the U.S. naming board agrees, the second-tallest point in White Pine County’s Snake Range will return to its traditional Shoshone moniker, Doso Doyabi, which means White Mountain. State naming board member Christine Johnson said the name was proposed by members of eastern Nevada’s Duckwater Shoshone Tribe and drew support from three other Nevada tribes. She said two Duckwater elders told the board they first heard that name from their mother, who grew up in Baker, Nevada, on the eastern slope of the Snake Range. “When they were young, their mother said the mountain was called Doso Doyabi because it always had snow on it,” said Johnson, who serves as collection manager for the Nevada Historical Society in Reno. Cartographer and fellow board member Jack Hursh said he was delighted to vote for a name that honors — and was chosen by — the Duckwater people, some of Nevada’s original residents. “I think it’s a beautiful name. I think it’s a strong name,” Hursh said. The push to erase the name of the Confederate leader from the 12,771-foot peak began in 2017, after the deadly rally in Charlottesville, Virginia, sparked by white supremacists. The state board also received a proposal from a man in California who suggested that be renamed after Robert Smalls, an escaped slave from South Carolina who fought for the Union and was later elected to Congress. Though certainly worthy of such an honor, Smalls had no real connection to Nevada, Johnson said, so the board opted for something with local ties. An aptly named branch of the U.S. Geological Survey called the Board on Geographic Names will have the final say on the matter — just as soon as the partial government shutdown is over. Johnson declined to predict when that might happen, but she said that under normal circumstances the federal naming process usually takes about three months and rarely ends in any surprises. “Generally the U.S. board seems to find in the same way we do,” Johnson said. Davis’ name originally graced what is now known as Wheeler Peak, the tallest summit in the Snake Range and Nevada’s second-highest point, at 13,063 feet. 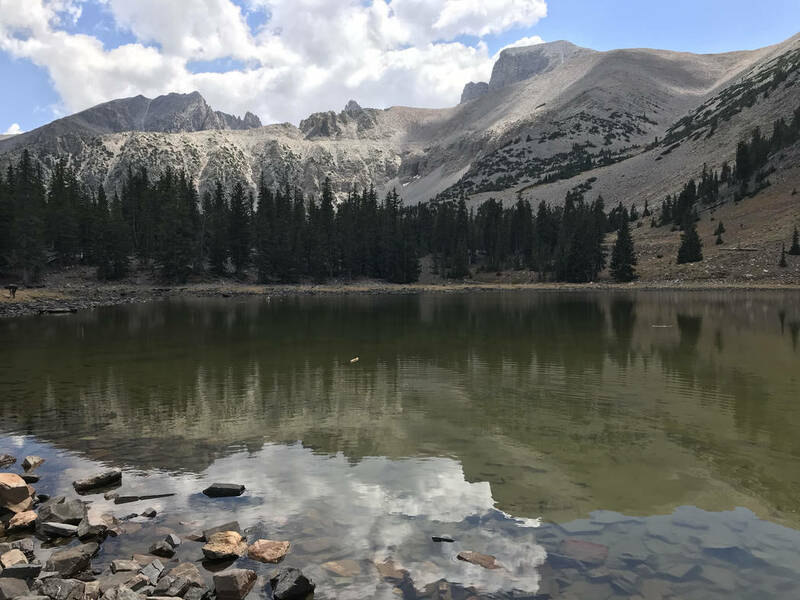 Lt. Col. Edward Steptoe from the U.S. Army Corps of Topographical Engineers spotted the peak during a survey of the Great Basin in 1855 and named it for his boss, then – U.S. Secretary of War Jefferson Davis. There was talk of changing the name, possibly to Union Peak, after Davis sided with the South in the Civil War, but nothing was done until after the conflict, when surveyor George Montague Wheeler scaled the peak and named it after himself during a mapping expedition in 1869. In the process, Davis was demoted to the shorter summit nearby. Johnson said she heard a few private concerns from people who worried that Davis’ pre-Civil War contributions to the nation were being revised into obscurity, but the board received no letters of opposition or public comments against the proposed change. If the U.S. board agrees with the state’s enthusiastic recommendation, Doso Doyabi will become the official name of the summit. Nevada’s Board on Geographic Names managed to sidestep both controversy and redundancy on Tuesday when it approved a name change for the state’s third tallest summit. Doso Doyabi, the new name for Jeff Davis Peak in White Pine County, means “White Mountain” in Shoshone, so the board opted to leave off the word “mountain” or “peak” from its recommendation to the federal board on geographic names.